The second day of the APC national specialty event was a walking field trial, also held on the YPS grounds in Pennsylvania. Early in the morning, waiting for the judges at the Open Gun Dog course break-away. 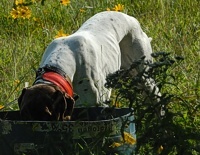 Though there are water troughs out on the course, this handler's wisely packing a bottle or two. It's a long walk. A just-off prace quarters in front of the judges. 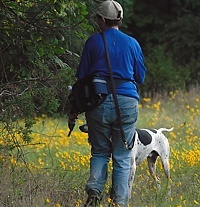 Blank gun in hand, this handler inspects the cover around the tree her dog is steadily pointing. 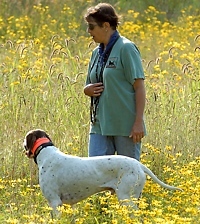 A handler walks up on her pointing dog, judges right behind her. Another point! The quail are really going for the trees in the hot air. 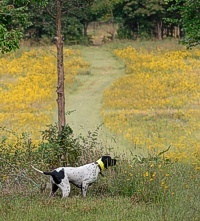 Stella working a hilltop quail along the course. The mounted judges have a perfect view of this point. And she's steady enough to let the gallery come in for some of the action. The quail she's on has wisely moved into the shade. In between braces, a quick look at what's waiting at the end of the day. Hot, but moving with a purpose. A brief pause along the back course. And the handler starts into the cover for the flush. Crucial on a hot day, the club has positioned water stations along the trial course. 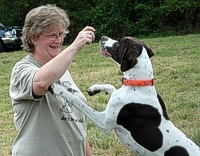 Veteran dogs actually look for them as they work. The breakaway in the Open Puppy stake. Some festivities as the placements for the Open Puppy stake are announced. 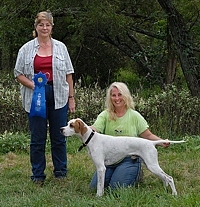 The Open Puppy Stake placements. Sure, we're not supposed to do that. But it's fun. In the Amateur Hunting Dog stake, on point. So THAT's why the quail were so hard to find later in the day. This capable hunter was hanging out on the lower half of the course, fat and happy on quail meat. 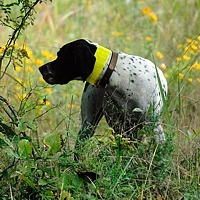 On the Amateur Hunting Dog course, two bracemates discover that the birds have been coveying up in the woods. Steady, there! The pressure really goes up once the handler starts kicking around for that bird. This Pointer is very pleased with his find. Late in the day, all of the action is in the treelines. In the fading light, this fellow is covering ground as part of the last brace of the day. Dog and handler, both hot and tired after a run in the Derby stake.